See more Free People Sleeveless and tank tops. 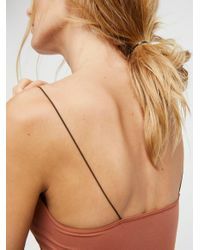 We check over 450 stores daily and we last saw this product for $28 at Free People. American made from our Signature Seamless fabric, this stretchy brami features elastic straps and a ribbed hem. Warning: This product contains a chemical known to the State of California to cause cancer and birth defects or other reproductive harm. Machine Wash Cold. Made in the USA. Bust: 22.0 in. Length: 15.25 in. 8% Spandex. 92% Nylon. Please Note: The straps of the Mustard colour are b. Unlike the white shown in the photos.